Pinnacle Signature Series II Carnauba Paste Wax creates a warm, wet-looking shine with nature's finest wax and fruit oils. The results are sizzling shine, depth, and reflection that enhance any type and color of paint. Signature Series II is the most impressive wax in its class. Pinnacle Signature Series II is an exceptional value. One 89ml jar of Pinnacle Signature Series II contains at least 10 glossy applications. Signature Series II contains no cleaners and can be layered multiple times to increase depth and brilliance. During research and development, he found that the “jetting factor” of the wax could be improved with the addition of a new liquid crystal polymer. This polymer was originally designed to form resins for use in electronic connectors. For our purposes, the polymer is left in a semi-liquid state that both softens the carnauba and enhances the wax's reflective nature. The result is a wetter, glossier finish that brings out the best in any color paint finish. 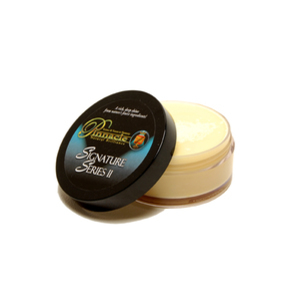 Just like Pinnacle Souverän™, the prime ingredient in Pinnacle Signature Series II is Brazilian Ivory Carnauba. Carnauba wax is world-renown for its crystal clarity, its protective properties and its uncanny shimmer. No other natural wax is as sought after as No. 1 yellow carnauba wax, deemed the purest and highest quality by Brazil's government inspectors. 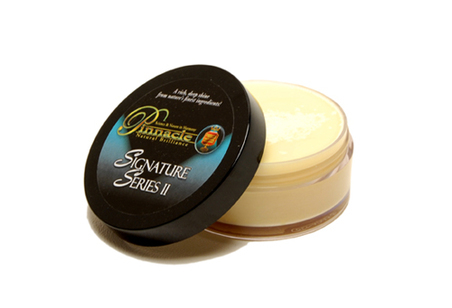 Once our chemist purifies the wax again, it is blended with Pinnacle's proprietary ingredients to make Pinnacle Signature Series II. 1. Wash vehicle using Pinnacle Bodywork Shampoo. Towel dry with a microfibre towel, such as the Mammoth Triple Twisted Drying Towel. 3. Apply Signature Series II by hand using a Polyfoam Wax Applicator . Apply a thin, even coat to one panel at a time. 4. Signature Series II does not dry to a haze. Once you've covered a panel, you can immediately buff using a clean, soft microfiber towel.